What do you know about Hot Stones? What is your experience with Hot Stones? Many reviews from clients who have shared their experience with us about hot stones in a massage can be both positive and negative. For many that we have heard from, it seems that they weren’t very impressed with their experience. Concern #1 - Stones are only placed on certain parts of the body. This concern is valid for a couple of reasons: First, when you choose a hot stone massage service, your first assumption is that you will receive a massage with hot stones. So…. You book your massage, you arrive at the spa, you get on the table, and you’re all excited and ready to go! Then the Massage Specialist begins… the massage has started, and the Specialist places a stone on your back. And that’s it. . . .
Because the stones used in massage can either be heated or cooled, it is understood how placing stones on a particular spot on a client’s back or neck can help to warm (or cool) the body’s temperature and ultimately promote relaxation; but at Marchell’s we do not consider this a hot stone massage. 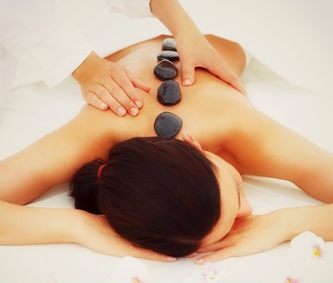 Hot stones can be used throughout your massage session AND all over your body! This will additionally impact your body’s temperature and enhance your relaxation so that you actually feel the warmth of the stones with the Specialist’s massage strokes. And at Marchell’s Day Spa, even if you don’t select our Hot Stones Specialty Massage, you can ask our Specialists to place hot stones in the palms of your hands to gently warm your body temperature, and it keeps the Specialist’s hands warm as well. Our Technicians will always find ways to make your massage session a better experience by making sure that you are comfortable and at ease. By receiving a massage on a regular basis, you will begin to see how things that you are required to do daily, can be done with much less pain and agony. You are not only stimulating the blood flow through your system, but it has been scientifically studied and determined that the endorphins that are released resulting from a massage can help improve your immune system! That’s a Win-Win scenario! A massage can relieve pain (almost instantly) AND it can help the body to fight off a cold that tries to hamper your ability to endure daily duties!